If you’re a PADI (Junior) Open Water Diver who is at least 12 years old, you can enroll in the PADI Night Diver Specialty course. The PADI Night Diver Course is for ages 12 Years and Older. Extend your bottom time with Enriched Air (Nitrox). This PADI course does not increase your maximum depth rating. Standard depth restrictions apply. all participants will need to have a completed set of liability releases signed and dated prior to any in water training. Note: Participants under the age of 18 will need to have a parent or guardian signatures as well. No exceptions. The duration of this Course is 2 ½ days.The course is performance-based so we do not like to rush we want to make sure everyone is safe and fully understands the skills of the day. So there is a start time but never a set finish time. 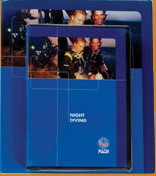 For your course you will need the PADI Night Diver Crewpak. If you purchase your PADI Night Diver Crewpak at the time you book your course. You will receive your hard copy when you arrive at class.For your convenience we will provide you with all the materials you will need to get you started as soon as you book your course..
Each student is required to purchase from us their own PADI Night Diver Crewpak. Is there anybody home ? Get Your PADI Night Diver Course Certification Today. Just turn on the light and you’ll see a whole different world at night. With the PADI Night Scuba Diver Course you’ll see things that only come out at night which gives the reef a whole different look. You haven’t truly experience scuba diving until you go on a night dive. So if you’re looking for some exciting nightlife I’ll take you to the coolest club in town. The Reef Club. The purpose of the PADI Night Diver specialty course is to familiarize divers with the skills, knowledge, planning, organization, procedures, techniques, problems, hazards and enjoyment of diving at night (For the purpose of training, night is considered any time between sunset and sunrise). The Night Diver specialty course is intended to serve as a safe and supervised introduction to night diving. Training emphasizes fun and safety. The goals of PADI Night Diver training are: A. To develop the student’s practical knowledge of night diving. B. To enable the student to organize and safely conduct night dives. You begin the academics in the comfort of your own home. Once you sign up for the course, you will receive all the academic materials needed to complete the home study portion of your course. To start your course you will watch The PADI Night Diver course video and complete your knowledge reviews in your PADI Night Diver Diver Manual. This will get you ready for Your classroom session and the in water training portion of your class. Your instructor will review your knowledge reviews during your first class session. Unfortunately PADI does not Offer Online academics for this course yet. You and your instructor will schedule the time for you to come in and complete the academic portion of your training in the classroom. Note: online academics is not available for ages 12 and under. Open Water Training Dive 1 • Execute a descent using a line or sloping bottom as a reference. • Demonstrate how to communicate with hand signals and dive lights while night diving. • Demonstrate the proper use of a personal dive light, submersible pressure gauge, compass, timing device and depth gauge at night. • Navigate to a predetermined location using a compass/natural features and return to within 8 meters/25 feet of the starting point, surfacing for orientation only if necessary. • Demonstrate proper buddy procedures by maintaining buddy contact throughout the night dive. • Perform an ascent using a line or sloping bottom as a reference. Open Water Training Dive 2 • Execute a descent using a line or sloping bottom as a reference. • Demonstrate how to communicate with hand signals and dive lights while night diving. • Demonstrate the proper use of a dive light, submersible pressure gauge, compass, timing device and depth gauge at night. • Using a compass for navigation, return to the shore or boat underwater with at least 35 bar/500 psi remaining in your scuba tank. • Identify nocturnal aquatic life discussed during the academic portion of the course. • Demonstrate proper buddy procedures by maintaining buddy contact throughout the night dive. Open Water Training Dive 3 • Execute a “free descent” using the line or sloping bottom as a visual guide only. • Demonstrate how to communicate with hand signals and dive lights while night diving. • Demonstrate the proper use of a personal dive light, submersible pressure gauge, compass, timing device and depth gauge at night. • Remain in a stationary position for three minutes, on the bottom, with no dive lights on. • Demonstrate proper buddy procedures by maintaining buddy contact throughout the night dive. At this level divers should have a complete set of personal SCUBA gear. Don't panic if you need rental equipment we have it available for your class. For this class divers are required to have a SMB (Surface Marker Buoy) Compass and a reel. If you would like to purchase your own equipment, we guarantee the best price in town and extended warranties on everything purchased from us. If you’re going to be a diver it is best to have your own personal gear for fit and comfort. You should always purchase your SCUBA diving equipment from the dive center where you do your training. Your SCUBA instructor is definitely more qualified to make sure you select the proper equipment for your needs. Your instructor will also make sure your equipment is properly adjusted and ready for your class. Nobody beats our prices or customer service guaranteed. We do not accept equipment that is unsafe or damaged to be usedin anyof our programs. If you have any questions on whether the equipment you have will be acceptable for this program, please contact us prior to class for a free equipment evaluation. We service and repair Scuba equipment. Safety First!